Suitable for groups, families, the young and a bit older. If you want to meet the flora and fauna of the island of Mljet and merge with nature we suggest an organized hiking on the marked hiking trails. Choose one of the suggested routes adapted to your need , don’t overestimate your abilities, our guides are with you to reach the goal safely. 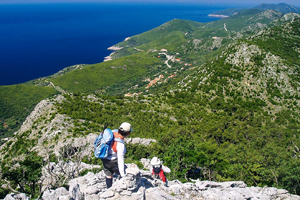 Mljet hiking detour was opened on April 28, 2012 to celebrate the Day of the Croatian hikers. The detour is for all hiking lovers who recognize the true value of spending time in nature. Mljet’s hiking detour is 43 km long and it lasts about 3 or 4 days or cca 23 hours of walking. The whole path is marked and equipped with control points. There are 20 control points on the way. Depending on where the route ends, we return to Pomena on foot or by a minibus when the hiking finishes. Our service offers transport from your accommodation to the Port of Pomena or you can arrive on your own. If you want a different itinerary? Send a travel request to your liking! The time of departure/arrival is flexible.